Don’t be surprised to have the next celebrity couple to be Becca and Bisa Kdei. Becca shared a picture of Bisa Kdei on her instagram few minutes ago and with the kiss attached to the picture, we can say with no fear that Becca and Bisa Kdei are officially dating. Checking the comments from fans on her timeline, it seems we are not just the only people happy for these great musicians in Ghana. 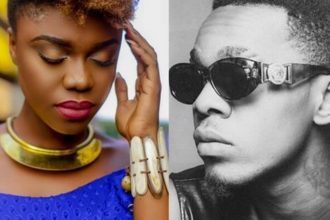 Becca and Bisa Kdei aside their mutual feelings for each other have other additions in common; they are two talented musicians, song writers and mostly singing about love. So clearly, they are a perfect couple.